Manipur Governor Dr Najma Heptulla on Friday saidbamboo provides a new alternative to the many uses of wood as a material while it may even be a novel item of nutritious food for advanced economies of the world. 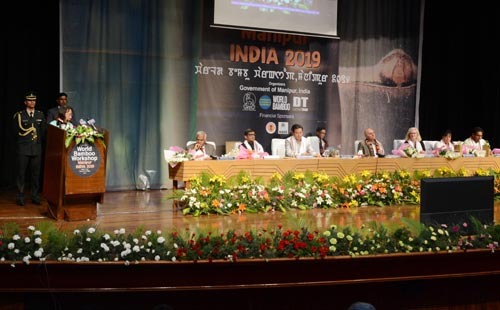 Governor Dr Heptulla was speaking at the closing function of the five-day third World Bamboo Workshop at City Convention Centre in Imphal East District. The workshop was organized by Manipur government and world bamboo organization(WBO). Stating that Manipur is blessed with an abundance of natural growth of bamboo which has made this “green gold” an integral source in the lives of the people of the State, Dr Heptulla said that the workshop will throw light on how the State can develop its huge potential in bamboo to provide economically viable and alternatives to its people adding special focus has also been given on projecting bamboo to be a part of New Urban Agenda. Highlighting the potential of the bamboo for the economic growth of the region, she is confident that the exchanges of information, knowledge, know-how, demonstration of latest technologies and sharing of the technological advancements in the development of bamboo, used both as raw material for construction and as nutritious food items through the workshop will definitely benefit the people of the State. The thrust area in the Workshop has been promotion of sustainable plantation, development and use of the natural product of bamboo for the benefit of the communities which have huge natural growth of bamboo.The next 4thedition of the world bamboo workshop will be held in Taiwan next year. Secretary (DoNER) Navin Verma, Additional Chief secretary (Forest & Environment) Dr Suhel Akhtar, President Michel Abadie of WBO, Executive Director Susanne Lucas and International Coordinator Motera also attended the closing event.